The team of the newly-elected East Delhi Municipal Corporation (EDMC) will also take charge today. BJP, will have its mayors and deputy mayors in all the three civic bodies. 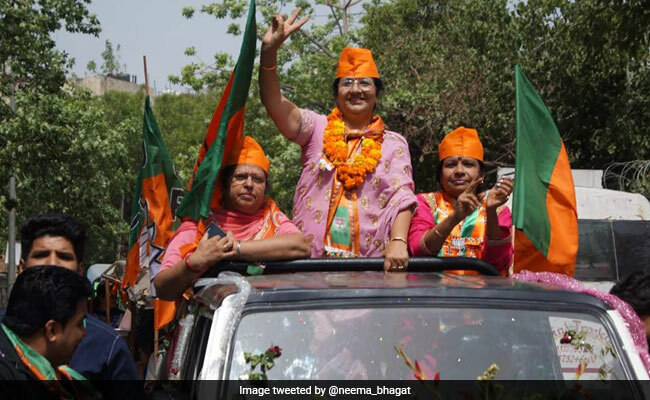 New Delhi: BJP councilor Neema Bhagat is set to be elected as the mayor of East Delhi today, after the ruling party won the mayoral post unopposed in north and south corporations last week. BJP's Patparganj councilor Bipin Bihari Singh will become deputy mayor in EDMC. Mr Bhagat, who represents Geeta Colony ward, had defeated her AAP rival Pooja Chhabra by a margin of 2,869 votes in the high-stakes MCD polls held on April 23. Last year, BJP's Satya Sharma, councilor from New Usmanpur, had trounced Congress rival Taj Mohammed for the post of mayor of east Delhi. The saffron party has fielded its councilors Pravesh Sharma, Mr Santosh, Satpal Singh, Kiran and Kanchan Maheswari for the posts of members of the EDMC's standing committee, while AAP's Rekha Tyagi is in fray for the same. On May 18 and May 19, BJP's Preety Agarwal and Kamaljeet Sehrawat were elected unopposed for the post of mayor in the North Delhi Municipal Corporation and the South Delhi Municipal Corporation, respectively. After the election, the BJP, which had swept the civic polls, will have its mayors and deputy mayors in all the three civic bodies. BJP had bagged 181 of the 270 wards in the polls. In the 64-member EDMC House, the BJP has 47 councilors, AAP 11, Congress three and BSP two. Elections in two wards were postponed due to the death of candidates. EDMC's Maujpur ward went to polls on May 14, while polling in NDMC's Sarai Pipal ward was held today. Results for both wards would be declared on May 23.